What's The Harmonic Minor Scale? The harmonic minor scale contains seven notes. The interval pattern is 1 - 2 - b3 - 4 - 5 - b6 - b7. It is built the same as the natural minor scale (Aeolian mode) but the seventh degree is raised by one semitone. Here is a comparison between the natural minor scale and the harmonic minor scale. Theoretically the harmonic minor scale should be played over minMaj7 chords, but it can also be used over minor chords like m6, m7, m9, m11, m6/9. Playing the harmonic melodic scale over a minor 7 chord creates tension because of the major seventh. To attenuate this tension you need to resolve you lick on a proper note. 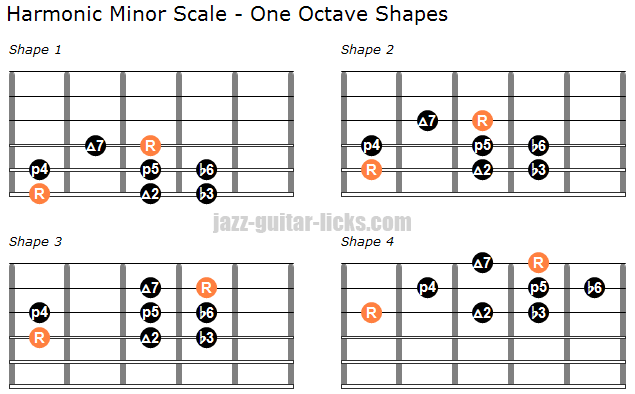 Here are four diagrams to play the harmonic minor scale on your guitar. Each shapes contains tones within the space of one octave. The most easy way to learn the scale is to play it starting from the root note (R in the graphic). You can starts with the shape 1 with the roots on the 6th and 4th string. Be sure to play it in twelve keys. Then, you try the 2nd shape with the roots on the 5th and 3rd string, then the second and the first. These two shapes show the harmonic scale within the space of two octaves. Remember to practice them slowly, the speed will come later. You can also practice these shapes in quarter notes, eighth notes or even sixteenth notes. How To Harmonize The Harmonic Minor Scale? Here are the chords built from each degree of the harmonic minor scale. Triad chords are made of three notes stacked in thirds and tetrad chords made of four notes stacked in thirds too. For example the first chord, C minor(maj7), is built by stacking C, Eb, G and B respectively root, minor third, perfect fifth and major seventh. Once the harmonic minor scale is harmonized we get a major seventh chord (sixth degree), one augmented chord (III), two minor chords (degrees I & IV), one minor seventh flat fifth chord on the second degree (II), one dominant seventh chord (V) and one diminished seventh chord on degree VII. Augmented chords are necessarily majors and diminished chords are minor. Quadrad chords in the key of C minor. Here is an example of use of the harmonic minor scale over a minor II-V-I sequence. The following sequence contains three chords related to the harmonic minor scale. By taking the second (Dm7b5), the fifth G7(b9) and the first chord of this scale you get a minor II-V-I progression present in many jazz standards as Autumn leaves, Black orpheus, Blue Bossa, Stella by Starlight...). It is very important to master this jazz sequence. Basically, you can play the D harmonic minor scale over the whole sequence. You could also play the D Locrian mode or a D half-diminished arpeggio over Dm7b5, the G altered scale over G7b9... there are many solutions to improvise over a minor II-V-I sequence. In this lick, we will be playing the Eb harmonic minor scale over the Dm7b5 chord starting on the minor third (F). You can also think it as the D locrian # 2 mode. Playing this mode over Dm7b5 can bring an interesting color/tension, the #2 (or #9), to your guitar solos. Thanks for this really helpful page. Just noted there should be a 'natural' symbol on the B shown in notation for Ebmaj7#5?